AMG Quality Constructions is a team of highly qualified professionals ready to help you enhance your outdoor living spaces. 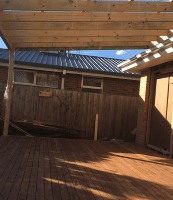 With many years of experience under our belts, we believe that you’ll find us to be Mooroolbark’s most creative and progressive deck and outdoor constriction companies. Experience the best of outdoor living with your custom AMG creation, whether it be a pergola, deck, verandah, carport or anything else your outdoor space needs. Our mission is to remove the stress and worry from you during the installation process and leave you with an improved lifestyle. Let us help you to expand the possibilities for entertaining and relaxing at home. Pergolas act as an attractive feature in your garden, while also providing a source of shade and privacy. The structure of pergolas is unique in that it doesn’t obstruct the view but allows the eye to move beyond it, giving a sense of expanse. There are many different types of pergolas Mooroolbark residents can choose from, including house fixed; free standing; eave to eave and awning. With so many possible choices available, it can be confusing as to what you should choose for your home. We’ll work closely with you throughout your pergola project to make sure the final product is ideally suited to your needs. Whether you’re rebuilding old and tired decking or planning a deck for your brand new home, the team at AMG has the expertise to turn your outdoor area into a functional space where you’ll be proud to entertain your friends and family. Our decking Mooroolbark projects are custom designed to suit your home while also enduring the elements. They provide a unified transition from inside your house to outdoor areas. What’s more, decking can also increase your usable outdoor space. The AMG decking Mooroolbark team will give you expert advice on what materials to choose from so that you get the best match for both your home and your budget. The first step to creating your backyard paradise is to make an appointment giving us a call or email us for more information. As adding decking or a pergola is the most popular option for extending or updating a backyard, we’ve developed the trades, the expertise and a highly organised system to ensure that all our projects run as smoothly as possible. We’re always here to discuss ideas for your new deck or outdoor entertainment area so let us help you begin the transformation of your outdoor living space. To enquire about decking and pergolas Mooroolbark residents can call the AMG team on 0432 170 146.